Isn't this a great bench?! It got me thinking. The first 2 weeks of Chaplaincy work and training has been much like a marathon and fireworks show combined : a test of endurance with surprising explosions along the way. Although we , the chaplains, power from room to room and crisis to crisis , we have a very different goal for our patients. The majority of people we meet are experiencing some kind of anxiety and discomfort. Even though they are in physical pain , the throbbing hip or stinging surgical wound is minor compared to the mental strain they are under. Their minds are in a tail-spin of worry and dread. 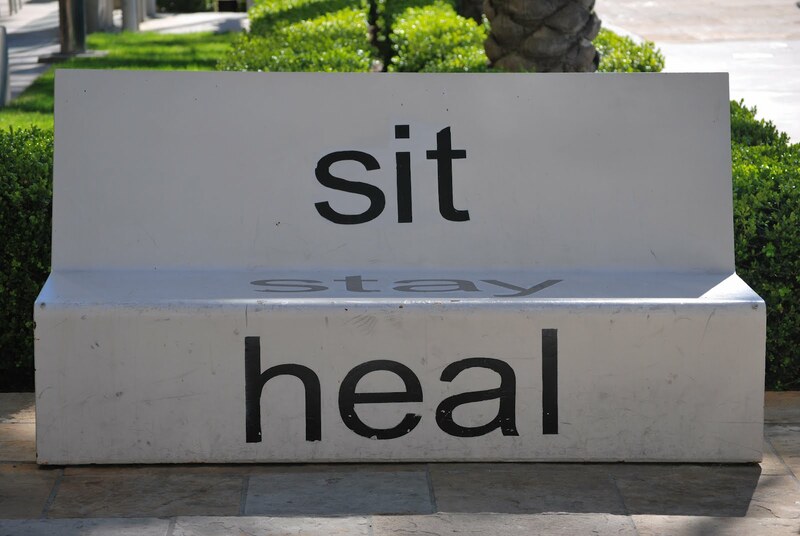 Our goal as Chaplains is to slow this tail-spin and encourage them to "sit, stay, heal". It is impossible to get to the point of healing without sitting (stopping the frantic race of "what if's") and staying (continuing in rest and trust). This is for all of us I think. It is important to sit down with Jesus , stay in His presence and receive the healing only He can give. Maybe I need my own bench like this...a place to stop and breath deeply with Jesus. What a powerful work that you are doing. Love the bench too!